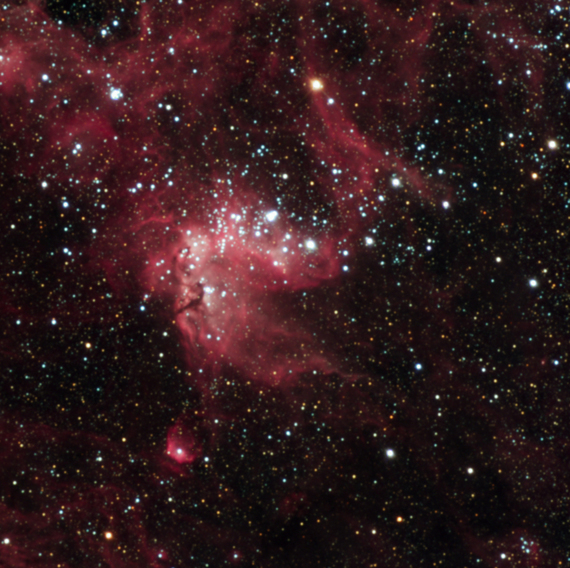 NGC 2074 is a cluster and nebulosity in the LMC that is infrequently imaged. Part of Henize 158, a 13 arcminute region directly S of the Tarantula. NGC 2074 is the brightest patch of N 158, a 3 arc minute oval patch. NGC 2074 is the brightest patch of nebulosity that is within half a degree of NGC 2070 (the Tarantula Nebula). The field of this image is approximately 10' x 10'. Used with permission, No reproduction of these images are permitted without written approval from Harvey.